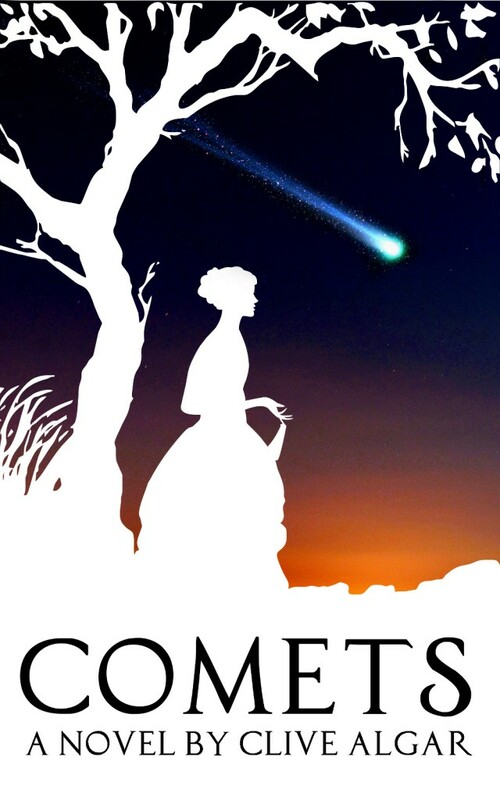 Set in the rich and fascinating milieu of Cape Town in the 1830s, with its shifting patterns of social awareness and the growth of scientific knowledge, Comets tells the story of James and Isabelle Forster, whose lives, and those around them, are changed irrevocably not only by the appearance of a real comet – Halley’s – but by human “comets” including the aristocratic Michael Percy, the young Charles Darwin and a recently-emancipated slave couple, Adam and Catharine Cupido. James and Isabelle’s comfortable upper middle-class existence threatens to spin out of control as they confront moral crises they seem unable to resolve. Comets by Clive Algar is one of the best general fiction books I have read in a long time. It is full of life, love and romance. I really enjoyed this book. The author did an excellent job of developing a tale which captured my interest and would not let it go. The story takes place in South Africa in the early 1800s and is so realistic it carries you there. The pace was great and the storyline was very realistic and believable. I really liked the way Clive Algar developed his characters. They were easy to believe in and identify with. His writing style made it easy to get into the characters, their role and historical era. I really enjoyed Comets by Clive Algar and highly recommend this book to all readers. Not only is this a well-written novel providing insight into life in Cape Town in the 1800s, it offers insights into the great scientific debates also emerging at the time. Algar does a splendid job in developing his main characters with detail that brings them to life. Recommended to anyone who wants to know more about society, commerce, science and life in that era in that interesting part of the world. A very enjoyable and interesting novel with good character development. Very descriptive and well written story with sensitive handling of the various character's faith and morality issues. Excellent read. Kept me interested and excited. Characters well placed in the historical context. I wanted more, it finished too soon. This is a most interesting book in diverse ways. It provides a very well researched and cogent description of Cape Town and its inhabitants in the mid 19th century together with a lively and compelling narrative encompassing emancipation, love, lust, infidelity, faltering faith and the conflict between emerging ideas on evolutionary theory and religion. A well-written novel. Clever use of personification and skillful character development made it difficult to put down once I began reading. History and culture of the times were carefully woven into the fabric of the story. Being American, I found it interesting to be able to compare life in South Africa with that of the United States during that time period. A great read. Gift it to a friend.